Rudolph, the red-nosed reindeer Reviewed by Edgeville Buzz on November 24, 2009 . RUDOLPH, THE RED-HOSED REINDEERAn adults-only musical parody featuring Rudolph as a cross-dresser. Mary’s Attic, 5400 N. Clark, (773)784-6969. Dec 3-Jan 2. $10-$15. 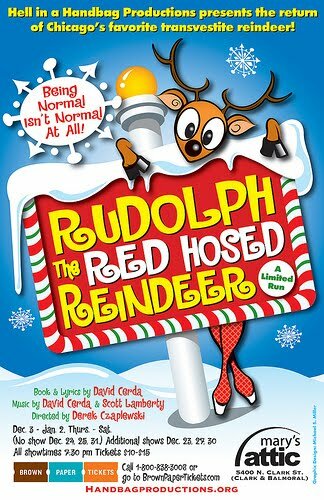 An adults-only musical parody featuring Rudolph as a cross-dresser. Mary’s Attic, 5400 N. Clark, (773)784-6969. Dec 3-Jan 2. $10-$15.